As a c# developer there are a few tools which I cannot live without. Visual studio obviously (and VS11 is the best yet IMHO) and the other is Resharper. When I write my c# code I like to follow TDD principles and ensure my code is highly testable. These days if I don’t have tests around my code I feel very exposed when refactoring, it’s this safety net that I want to ensure I have in the TypeScript world too. 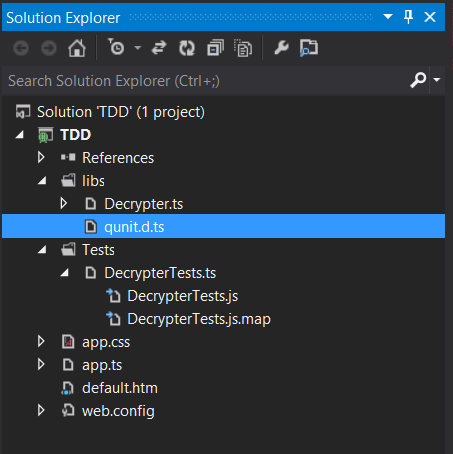 In Visual Studio I created a new TypeScript project and copied my Decrypter class into a libs folder. I also created a new Tests folder where I added another new class called DecrypterTests which is where I will add all more tests. Now as I want to target QUnit for my testing I needed to understand the QUnit API. On their website it shows a very simple example of what it takes to create a QUnit test. Only two method are needed from the api those being “test” and “ok”. You can see that there is not much to the definition file. When you add a definition file in TypeScript you are supposed to add a “.d.ts” in order to clarify that this has no implementation. Now I should have all the pieces in place so that I can write a test for my Decrypter class. The method I want to write a test is the GenerateRandomKey method which is supposed to create random key which is 50 chars long. In order to test this functionality I now need to import 3 references into my test file. Firstly the TypeScript file for my Decrypter class, then its compiled JS file, and finally a reference to the QUnit definition file I created. You may notice that I haven’t included a reference to the QUnit.js file. This is because Resharper handles this for us by references the file automatically when it goes to run the tests. Therefore we can just omit the references. After we have the correct references we can go about writing our test. This case is dead simple but illustrates the point. The QUnit.d.ts file provides me with full intellisense and type checking. The only thing left to do is run the tests to make sure they pass. 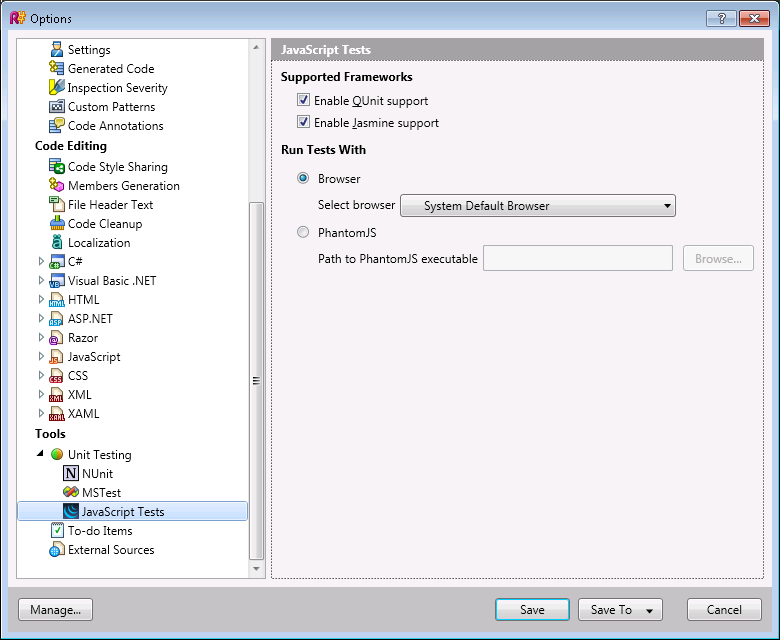 I can do this in Visual Studio by right clicking on the “Tests” folder and choosing “Run Unit Tests”. Resharper automagically finds the QUnit tests and executes them.